Earlier this week the Supreme Court of the United States released two controversial rulings that seemingly flew in the face of hundreds of years of legal precedence, as well as past rulings from the conservative justices currently sitting on the court. 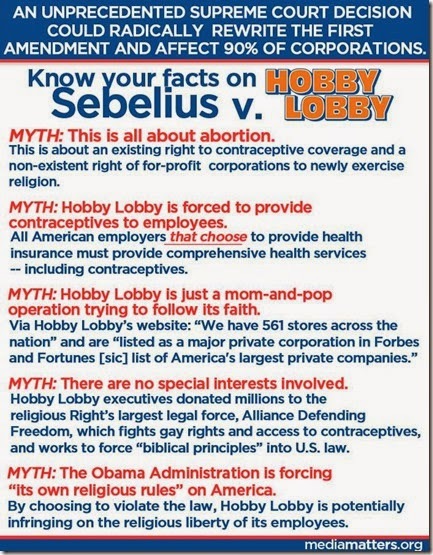 In one case, Hobby Lobby v. Sebelius, the so-called "religious" closely-held company decided that since Barack Obama won election and passed his signature health care law they all of a sudden opposed certain provisions that they previously had no problem covering. Their argument: claim the new law violated their religious convictions as a corporation and that abiding by the neutral and beneficial law would cause an undue hardship on their ability to be good religious what-nots. 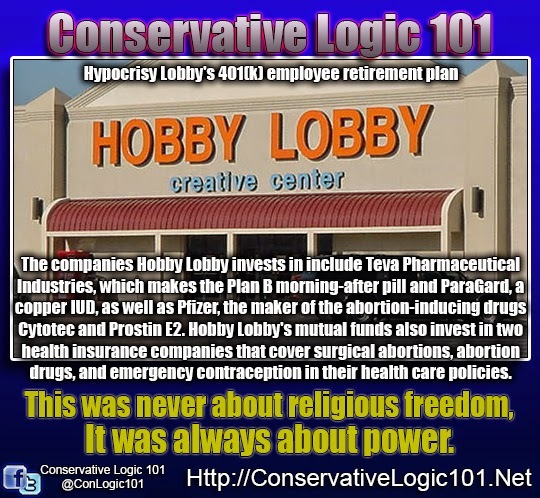 The conservative justices ignored all the hypocrisy, such as the fact that the corporation used scientifically-debunked data to claim birth control was "abortifacients," that despite opposing the birth control mandate the sincerely religious corporation invested money for another employee benefit (401k) into the corporations that produce previously mentioned birth control, and that prior to the passage of the law the religiousness of the corporation did not conflict with providing the birth control in states that required coverage. This ruling has also led to such "religious" companies to drop birth control coverage because they believe birth control is murder, like Trijicon, Inc., the firearms aiming systems manufacturer. That is right. A company that designs tools to improve killing is upset about covering medicines for their employees because they believe those medicines equate to killing. The other case was Harris v. Quinn, which ruled that the First Amendment prevents unions from collecting dues from workers who do not wish to associate or support those unions, despite benefiting from the bargaining conducted by the union. While I can understand the rationale behind this ruling, I have one huge gripe about it - the conservative justices have no problem extending First Amendment protections to workers (so long as those workers oppose unions) and corporations, but extending those protections to a union? The reason for a union collecting agency fees from workers who do not wish to join but benefit from the bargaining is that the law requires a union to represent everyone despite not everyone wanting to join. If a union has to represent a worker regardless then there is no incentive for a worker to join - they can sit back and reap the benefits. The Supreme Court said this is okay, because forcing someone to pay the union violates their right to freely associate with anyone they want. This is where the unions may be able to benefit from this ruling. They could also claim that by having to represent the free-loaders they (as in the workers who have decided to unionize and become a collective force) are being forced to associate with those who wish to ride on their coattails. If unions were freed to only represent those who join, they could negotiate better terms for their members while those workers who believe they would fare better if they negotiated on their wold be free to do so, and enjoy their reduced benefits and wages as a result.